Joyce Kilmer Memorial Forest is a truly special place. Getting there takes some time – about 2hrs, but the opportunity to wander around it’s exceedingly rare old growth hardwood is well worth the trip. 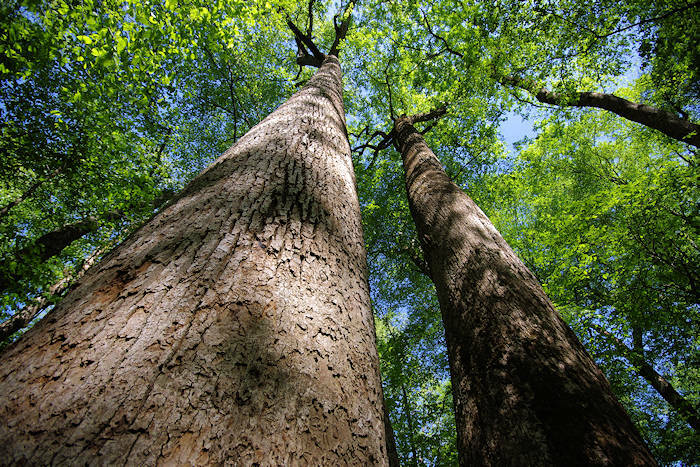 Wandering around it’s numerous loop trails, expect to find tulip poplar trees over 100′ tall and 20′ in circumference. This is a true step back in time to what our forests were like prior to the logging boom of the early 1900’s. These breathtaking beauties are particularly spectacular if you can catch them in the fall. Location: Approx. 2 hours west of Asheville. Take I840W to Exit 27. Exit right onto U.S. 19/74 toward Waynesville. Go about 47 miles, and bear right on NC 28N. Go 5 miles, and turn left on NC 143 to Robbinsville. From Robbinsville take NC 143W. After about 12 miles, turn right on Joyce Kilmer Road (SR1134). Go 2 miles and turn left to memorial forest.